Our last stretch in Mexico took us along the 'coast' of the state of Chiapas, unfortunately the road was about 20-30 km from the coast, so we didn't benefit from endless beaches and ocean swims. But, every 20 km or so there was a beautiful clear river running from the mountains into the ocean so we had some nice refreshing swims to provide relief from the heat and humidity. During the first couple of days of this stretch there was actually not a whole lot to report... The terrain was rolling low hills which made for some pretty fast riding. This was a nice change from the endless mountains of Oaxaca. Just as I was thinking about how relatively 'uneventful' the last few days of riding were... I had a pretty major crash. Not to worry, I am fine now. Some of you might remember how I was singing the praises of my front rack repairs, and wrote (very prematurely) that it was much stronger than the original design. Well it turns out that it was not, the piece that attached the rack to the bike stem (part of an old pedal, if you recall) snapped, sending my front rack forward and wrapping it around the wheel and sending me skidding along the ground. 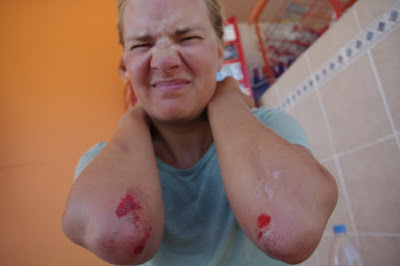 Just as we were assessing the damage to me and my bike a Mexican road cyclist came along...not a common sight. He was very nice and helped Glenn clean up my bike while I hobbled off to a gas station a few hundred meters away to sit in some shade and wash my wounds. I was pretty lucky just to have scratches, bruises and sore muscles; and my bike was lucky too, the rack was finished by the rest of the bike seemed in pretty good condition. After resting for a little while, and rearranging our gear so that it all fit in my back rack and Glenn's front and back, we carried on. About an hour later I was getting a headache and decided that I needed another rest. We stopped at another service station and had some food and drink. Then, the earth started shaking. Everyone left the building and stood in the open, it was pretty strong, but no damage seemed to be done where we were. When we arrived in the town of Huixtla that evening we learned that the epicentre of the 7.4 magnitude earthquake was offshore Guatemala, about 100 km from where we had been at the time. Guatemala does get frequent earthquakes, but it has not had one this strong since the 1970's. The town that saw the most devastation from this most recent earthquake is called San Marcos, where over 50 people died and many homes and buildings were ruined. We were actually planning on passing through this town, but decided to change our route through Guatemala as some of the roads in the area were reportedly washed out. We took the day off after the earthquake and my crash to recover a bit. I woke up feeling very very sore and my wounds were still raw (eww...). The following day we carried on to the Guatemalan border. We decided to cross at the town of Tecu Uman. We got to the border around 2pm, expecting a pretty quick and painless crossing. It was a pretty relaxed border as it was for pedestrians and cyclists only. However, we ended up waiting for three hours to get out of Mexico. When we arrived in Mexico over two months ago we each paid about $28 for a tourist card, we were given a receipt from the bank where we paid along with a tourist card. I kept both the receipt and the tourist card, Glenn unfortunately did not keep the receipt. But, who would have known that we would need a bank receipt to get out the country? Despite having the tourist card that indicated he had paid, officials insisted that they could not let him out of the country without a bank receipt. So after long discussions we finally agreed to pay again, but then it turned out that the immigration department of Mexico had just passed a new policy requiring them to use some sort of new codes and the system was very slow. So we waited and waited for our code so that Glenn could go and pay AGAIN! Finally we got to leave Mexico and enter into Guatemala!! !